Greek containership owner Danaos has painted a gloomy picture for the box ship charter market in 2018. It says it does not expect a “material improvement in the market environment”. Danaos is still reeling from the bankruptcy of Hanjin Shipping last September when charter party agreements for 13 vessels ended with several years remaining on the contracts. As a consequence, Danaos remains in breach of financial covenants on mortgages with RBS and other banks for loans maturing at the end of next year. Although the non-operating owner (NOO) was able to find new charters for the vessels – once they had been released from the clutches of other Hanjin creditors – the daily hire rates are thought to be at least 60% lower than those agreed with Hanjin. Danaos owns a fleet of around 55 containerships, ranging in size from 2,200 teu up to 13,100 teu. It recorded third-quarter net earnings of $30.1m from revenue of $117.7m. The income was significantly higher than the same period of the previous year when the full impact of the Hanjin insolvency hit its top line. The company said that, notwithstanding its covenant breaches, it was continuing to “generate positive cashflows” and was in discussion with lenders to refinance its debt. 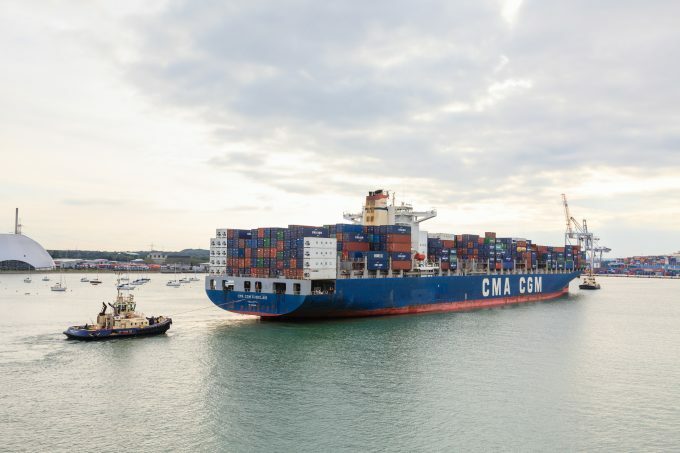 During a third-quarter results conference call, president and chief executive John Coustas said the market for sub-4,000 teu ships was “relatively stable”, while panamaxes were “facing more pressure”. With the fourth quarter typically the low season for big ships, Dr Coustas said Danaos “will have more clarity on the state of that market as we approach the peak season in the spring of 2018”. He said he remained pessimistic about the market. According to a review by vesselsvalue.com, as at the end of October some 50% of the 2017 containership orderbook is still to be delivered – most of which are larger vessels – suggesting that owners are pressuring yards to delay receiving ships they currently have no employment for. Ocean carriers will slow deliveries of their newbuilds to give them slack to off-hire chartered tonnage as those time charters begin to expire. In a recent Alphaliner report, the consultant said the NOOs were “bearing the brunt” of the over-tonnaging in liner shipping, evidenced by the fact that they control nine out of 10 containerships in lay-up. Alphaliner also noted that carriers with their substantial bargaining muscle were able to pick up new charters “at rates that continued a downward path”.